‘Take a Look: Aretha Franklin Complete On Columbia,’ features enough resonances of the Aretha Franklin that we have all come to (think we) know, that it demands a revaluation of Franklin’s career; one that inevitably only enhances her reputation as that of the greatest vocalist of the 20th Century. It is not unusual to hear the phrase “national treasure” used (in America) to describe the legacy of Aretha Franklin. Whether thinking her the voice of the Civil Rights Movement, or the embodiment of a womanish Black respectability in the late 1960s and 1970s, or her iconic performance at the inauguration of the 44th President, Aretha Franklin remains one of this country’s greatest creations. As such, there is a feeling that we all know her—how casually many of us simply refer to her as Aretha, as we all sing the lyrics to “Respect,” a song that was originally written and recorded by the late Otis Redding. For far too many, Franklin’s singular career began somewhere in Muscle Shoals country, at a mythic recording session that created some of the best music of an era—and if folk have a longer history to tap, it’s remembering Ms. Franklin as a 14-year-old singing in her father’s Detroit church. The new collection Take a Look: Aretha Franklin Complete on Columbia offers a new view of Franklin’s oft-forgotten career at Columbia Records, from 1960-1966, before she was signed by Jerry Wexler for Atlantic Records. As Daphne Brooks writes in an inspired essay that accompanies the collection, “So today, she is our national treasure…singing us ever so righteously into a colorful, new tomorrow. Hard to believe that, fifty years ago, she was an ingénue, stepping up to the microphone in the New York City studios of Columbia Records, boldly sounding out the ambitions of modern black womanhood at the dawn of the Civil Rights era.” Brooks’ counter reading of Franklin’s Columbia career, which has often been best described as the “Queen in Waiting,” suggests the need for a revisionist view of the 18-year-old who came to the big city in 1960 and by decade’s end was the most visible Black woman on earth. Jerry Wexler, Atlantic Records and even the Civil Rights movement can’t take all the credit for that. The career trajectory Franklin’s Columbia label-mate Streisand offers an instructive view of the limits that were place on Franklin during her career at the label. Streisand could be Streisand throughout the 1960s, without the encroachment of the Top-40 music scene (until it was her choice in the early 1970s), in part, because as a White female performer, she was allowed to simply exist an interpreter of show tunes and the like. Though Franklin’s Laughing on the Outside (1962), in retrospect, represents Columbia’s most successful attempt to package Franklin as a darling of the supper-club set, with brilliant interpretations of “For All We Know” (later covered by Donny Hathaway and Roberta Flack for Atlantic), “If Ever I Would Leave You” and the Franklin original “I Wonder (Where You Are Tonight),” the marketplace for Black artist in the early 1960s—with few exceptions—demanded they follow the gravy train of Motown (Ms. Franklin unconvincingly covers Mary Well’s “My Guy”), Stax and Warwick’s tailored-as-silk Soul/Pop confections. The Soul sound that we most associate with Ms. Franklin was still five years in the future. Franklin’s 1960 debut, simply called Aretha, paired her with the talents of pianist Ray Bryant, who also served as the musical director for the session. The session was produced by John Hammond, whose resume at the time included work with Bessie Smith and Billie Holiday. At 18-years-old, Franklin’s signature talents were already on display on tracks like “Maybe I’m a Fool” and “Today I Sing the Blues.” When Franklin reprises “Today I Sing the Blues” on her Atlantic recording Soul ’69—in many ways a tribute that initial session—it was clear that she was then a grown woman singing the song (“today my story’s a little different”). Revelatory from that first session is Franklin’s rendition of “Somewhere Over the Rainbow.” The song, which Judy Garland performed in The Wizard of Oz had generated renewed interest when the soundtrack from the film was released to coincide with the television premiere of the film in 1956. In the 1960s “Somewhere Over the Rainbow” would become a favorite tune for a young Patti Labelle, then fronting The Bluebelles. Though the song still remains Labelle’s signature, there are resonances of Franklin’s early version on that Labelle’s cover, which in many ways erases Garland’s imprint on the song. Indeed one of the purely musical pleasures of listening Franklin’s Columbia catalogue in its full contexts is hearing early gestures towards what Franklin’s music would sound like when she was at her artistic peak in the 1970s. For example “It’s So Heartbreaking,” from The Electrifying Aretha Franklin (1961) features a piano introduction, that Franklin would later resuscitate as the introduction to her remake of Ben E. King’s “Don’t Play That Song” from her classic Atlantic outing Spirit in the Dark (1970). 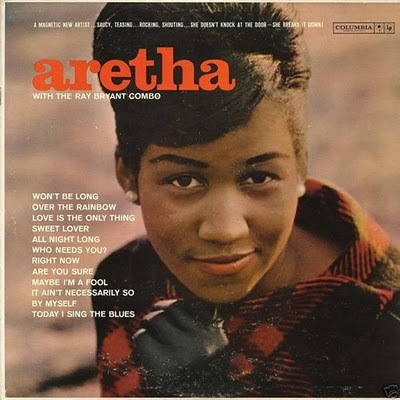 What was arguably a throwaway in 1961, became a critical component to one of her most popular tracks from the early 1970s; more evidence that Franklin’s later career was always in conversation with her earlier recordings—a reminder that the Aretha Franklin that she became was, in part, a product of working with men like her father, John Hammond, Ray Bryant, Clyde Otis and Bobby Scott and developing her own musical sensibilities in response. Franklin’s recordings The Tender, The Moving, The Swinging Aretha (1962) and Laughing on the Outside (1963) find Franklin coming into her own as a vocalist; her renditions of “Just for a Thrill,” Johnny Mercer’s “Skylark” and the aforementioned “For All We Know” remain some of her greatest performances from any era. Together, the two recordings should have made Franklin a star on the level that Streisand and Nancy Wilson were in the mid-1960s. Franklin, though, sounds tentative on Billie Holiday’s “God Bless the Child”—perhaps not quite ready to fill those shoes. Franklin was more than willing face up to the expectation already placed on her when she tackles a album length tribute to Dinah Washington in 1964; just as a young Washington, who died at the too young age of 39 in 1963, faced the daunting challenge of living up to the artistry of Holliday, and Natalie Cole would later face that same challenge in the 1970s standing in the musical shadow of Franklin. Washington once described a twelve-year-old Franklin, to her producer Quincy Jones, as the “next one.” Franklin’s relationship with Washington and her music was personal as she details in her memoir From These Roots (1999). Though Franklin would later claim Clara Ward as her “greatest” influence (and deservedly so, when you hear Amazing Grace), Washington’s influence is all over Franklin’s recordings at Columbia prior to her recording of Unforgettable: A Tribute to Dinah Washington (1964). The ten songs that appear on Unforgettable were all chosen by Franklin and include signature Washington tunes such as “What A Difference a Day Makes” and “This Bitter Earth.” As critic Michael Awkward writes in Soul Covers: Rhythm and Blues Remakes and the Struggle for Artistic Identity, “Franklin offers a riveting display of vocal power, a representation of rage whose source could very well be her inability to match or improve upon…her idol’s performance.” (60) Franklin literally finds her own voice on Unforgettable; the future was set in motion with this recording. The Unforgettable sessions also produced the track “Lee Cross” written by Franklin’s then husband and manager Ted White. “Lee Cross” was an inkling to Franklin’s immediate future at Columbia, as the company sought to have her record music more fitting to the burgeoning Pop-Soul sound of Little Anthony and the Imperials and Dionne Warwick. Franklin’s most popular release for Columbia, Runnin’ Out of Fools, featured production by Clyde Otis, who produced Washington’s later hits, and helped establish the career of balladeer Brook Benton (“Rainy Night in Georgia). Runnin’ Out of Fools (1964) features Franklin interpreting the “turn-table’ hits of the day including Brenda Holloway’s “Every Little Bit Hurts,” Dionne Warwick’s “Walk On By” (she later covers “I Say A Little Prayer” for Atlantic), Benton’s “It’s Just a Matter of Time,” Mary Well’s “My Guy” (a clear misstep) and the title track. In retrospect Runnin’ Out of Fools, might have been, Franklin’s most important Columbia album, not just because of its popularity, but because it hinted at how Franklin, began to imagine herself in a pop music world that was exploding in the midst of anti-Vietnam war demonstrations, the Civil Rights Movement and the death of Camelot. Clyde Otis seemed the perfect musical interlocutor for Franklin, as least from Columbia’s standpoint, as he oversaw the bulk of Franklin’s recording sessions until she left the label in 1966. Though Runnin’ Out of Fools and Yeah!!! (released originally with a canned audience) are the only studio albums that Otis produced while Franklin was still at the label, the Take a Look collection includes two full discs of Otis productions, Take a Look: The Clyde Otis Sessions and the unreleased master A Bit of Soul. Both discs are a revelation of the artistic mindset of an artist, who at that point, saw her success manifested in the Soul arena, instead of the Jazz, show tunes and pop balladry that Columbia unsuccessfully tried to fit her into. Rather than release the album A Bit of Soul, Columbia chose to issue singles, the most famous of which is “One Step Ahead,” which formed the basis of Mos Def’s “Ms Fat Booty” thirty-five years later. During those sessions in late 1964, Franklin also recorded an early Ashford and Simpson composition, “Cry Like a Baby.” The tracks from Take a Look: The Clyde Otis Sessions, represent a sort of middle ground—Streisand and Nancy Wilson are clearly in their sights—but it’s the title track, “Take a Look,” an Otis original , that stands out as the best tribute to Franklin’s early career, with lyrics that echo the trouble in the street, while exhibiting Franklin’s singular ability to “scream and cry” as Michael Awkward describes it. The year before Clyde Otis was brought into the fold, Columbia paired Franklin with the maverick producer Bobby Scott, best known for the compositions “A Taste of Honey” (see Lizz Wright’s recent treatment) and “He Ain’t Heavy, He’s My Brother.” Marvin Gaye was a longtime fan of Scott and sought him out in the mid-1960s to develop charts for a Sinatra-styled album that Gaye wanted to record. Those sessions were eventually released after Gaye’s death as the remarkable Vulnerable. Just as remarkable are Tiny Sparrow: The Bobby Scott Sessions, where Franklin brilliantly interprets fare like “Here Today and Gone Tomorrow,” “I Won’t Cry Anymore,” (which Gaye also recorded), “Looking Through a Tear,” and the breathtaking “Tiny Sparrow.” The production is lush and beautiful throughout, but it is not hard to imagine the suits at Columbia wondering aloud, what the audience was for the project. The bulk of the sessions sat in a can at Columbia until they resurfaced on the 2002 collection The Queen in Waiting. With the recent news of Franklin’s declining health, many critics have been trying to summon words to describe a career that has been peerless and indeed timeless. Take a Look: The Complete Aretha Franklin on Columbia allows Franklin’s music to offer the best assessment of a career, that in many ways, is simply beyond words. Mark Anthony Neal is Professor of African & African American Studies at Duke University and the author of five books of cultural criticism including the forthcoming Looking For Leroy: (Il)Legible Black Masculinities. Follow him on Twitter @NewBlackMan.